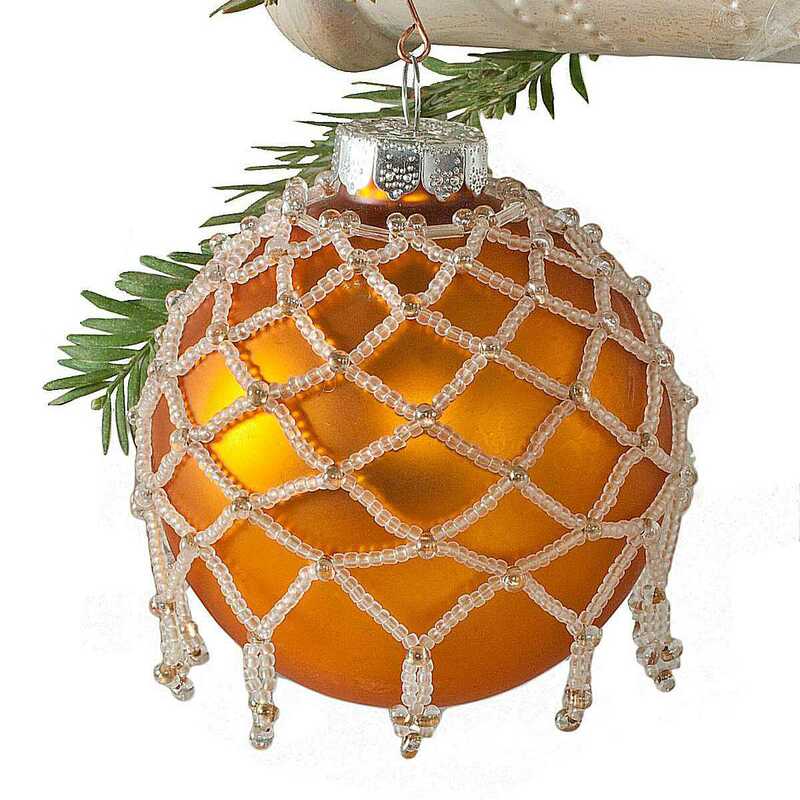 This pattern uses horizontal beaded netting to create a lacy Victorian-style holiday ornament cover. You stitch the netting in rounds, as a circular stitch, with simple increases and decreases to increase the size and drape. Once you master this basic technique, you can mix it up by adding more elaborate beaded fringe and using different combinations of bead styles and sizes. The bold capital letters above are the bead key identifiers. They're used throughout this tutorial as a shorthand to identify the beads in the pattern. Use the color thread that works best with the beads you selected for your bead cover. The pattern begins with a ring of beads strung on FireLine, and transitions to Nymo thread for the netting. The sturdy FireLine creates a strong framework for the cover, and is less likely to get frayed by the jagged edges of the bugle beads. The softer Nymo thread gives the netting a supple drape. Pull and cut a two-foot length of FireLine, and thread the needle. Fold over about six to eight inches of thread for single-strand beading. The top ring (which serves as the base ring in the circular netting) contains 10 bugle beads separated by sets of 2 drop beads with one size 11 seed bead in the middle. 1A, 1B, 1A, 1C, 1A, 1B, 1A, 1C, 1A, 1B, 1A, 1C, 1A, 1B, 1A, 1C, 1A, 1B, 1A, 1C, 1A, 1B, 1A, 1C, 1A, 1B, 1A, 1C, 1A, 1B, 1A, 1C, 1A, 1B, 1A, 1C, 1A, 1B, 1A, 1C. Pull the ends of the beaded strand together, and tie a square knot. End the Fireline thread by passing through several beads in the ring and cut the thread close the beads. Thread the needle onto the thread tail, pass it through several beads in the opposite direction, and cut that thread close to the beads. Prepare an arm-span (about three to four foot) length of the Nymo beading thread, and thread the needle. Add a stop bead about six to eight inches from the tail end of the thread. Pass through several beads in the top ring, and pull the Nymo through until you have reached the stop bead. Tie a half-hitch knot over the Fireline. Pass through several more beads, pull the Nymo gently taut, and tie another half hitch knot. Pass into the beaded top ring again, and bring the needle out after a size 11 bead (C). Pull the thread gently taut once more. For each stitch in the first round of netting, you'll pick up the following nine beads: 4 size 11 seed beads (C), 1 drop bead (A) and 4 size 11 seed beads (C). Pick up the first set of nine, and pass through the next size 11 seed bead (C) in the top ring. Pull the thread gently taut. Repeat this stitch nine more times, working your way around the top ring. When you reach the last stitch in the round (the ninth), complete it by passing into the next size 11 (C) in the top ring and through the first four size 11 beads (C) and drop bead (A) in the very first stitch from this round (see the third photo down on the left). This is the step up that occurs at the end of each round, to properly position your needle to begin the next round. For a diagram view of the general thread path in horizontal netting, please review the flat horizontal netting tutorial. As you add each new round the number of beads in each stitch will increase slightly. This will increase the size and length of the round to meet the growing size of the ornament. For the second round of netting, make an increase of two beads per stitch by picking up sets of 5 size 11 beads (C), 1 drop bead (A), and 5 more size 11 beads (C). Treat the drop beads (A) as the link beads that you pass through to complete each stitch. At the end of the round, step up by passing through the first five size 11 beads (C) and one drop bead (A) that you stitched at the beginning of the round. Place the beadwork over a three-inch round tree ornament. This is optional, but makes it easier to complete stitches in later rounds. It does not need to be the ornament you ultimately use for the cover, because the cover is removable. To keep the ornament from rolling, set it in a cup, on a deep plastic bottle lid, or any other item that will support it without allowing it to roll. Pick up 9 size 11 beads (C), 1 drop bead (A), 5 size 11 beads (C), 1 drop bead (A), 1 size 11 bead (C), 1 drop bead (A), 1 size 11 bead (C), and 1 drop bead (A), and slide them up against the beadwork. Pass back through the third from last size 11 bead (C) that you picked up (the one right before the first drop bead). Hold the small beaded loop that you just created between your fingers while using your other hand to pull the thread gently taut. Pick up 4 size 11 bead (C). Pass back through the first drop bead (A) that you picked up. Pull the thread taut again. Pick up 9 size 11 beads (C), and pass through the next link drop bead (A) in the previous round. Pull the thread gently taut. Repeat this pattern all the way around the ornament. When you reach the beginning of the round, weave-in to the beadwork and end the thread by trimming it close to the beads. Depending on the size of your starting thread, you may need to start a new thread while stitching. Thread the needle onto any existing thread tails that you haven't yet woven-in. Weave them in tying half hitch knots to secure as necessary and end them by using your thread burner or embroidery scissors to trim the thread close to the beads. The ornament cover is now complete! Make sure your thread tension is not too loose.